The Korean countryside is breathtaking...70% of the country is mountainous, and the majority of places you will visit are the mountainous National and Provincial Parks. This is at Sorak-san on the east coast. Its interior is for serious hiking enthusiasts. It's definitely a must-see. A string of lanterns on a path leading to a temple. 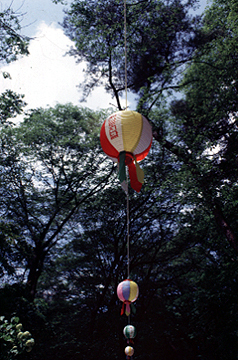 Korean Buddhist temples are decorated with these lanterns during Buddha's birthday. 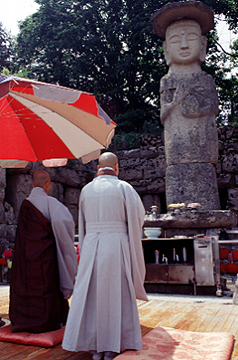 This is the double Buddha statue, Paju Miruk, in Kyonggi Province. 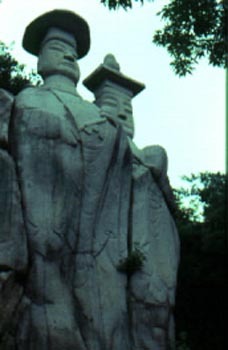 The bodies of this statue are carved in low relief into a flat rock face with separate stone blocks on top that make up the heads. Carved around 900 years ago, they are the only such twin figures in Korea. This is Popchusa, a temple in Songnisan National Park in North Chungchong Province. 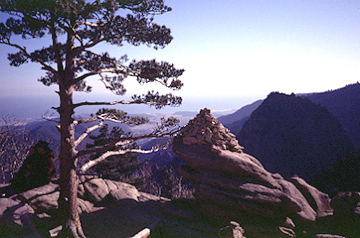 It's a great place to visit, and the mountains are an easy climb. 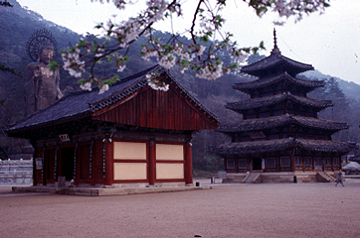 The five-story wooden pagoda (Palsangjon) seen here, is one of the oldest wooden buildings in Korea, and the only large wooden pagoda in Korea. It dates from the early 1600's. 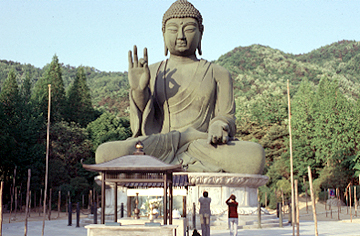 The Buddha statue is a Maitreya Buddha, the largest standing bronze Buddha in Asia. ..the 33-meter high Miruk Buddha of Popchusa (seen above). The bronze statue was cast in one mold and weighs 150 tons. It was dedicated to Korean unification and world peace. Nuns pray in front of the 10-meter tall Miruk buddha at the Miruk-saji temple site in North Chungchong Province. This is a recently excavated temple site of the Koryo Dynasty era. 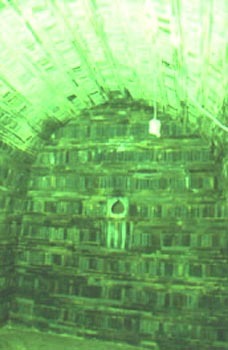 This is the interior of the tomb of King Muryong of the Paekche Kingdom. Located just west of the town of Kongju in South Chungchong Province, this tomb was discovered in 1971 and had been completely undisturbed since 529, almost 1,500 years ago. 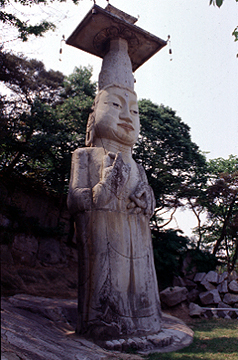 It is one of the most significant archealogical finds in Korea, due to its importance to the understanding of Paekche culture. The inner chamber of this tomb is lined with decorative brick tiles, and here you can see one of the teardrop-shaped candle niches that are set into the walls. ..here is a reconstruction of what the Paekche royalty looked like. 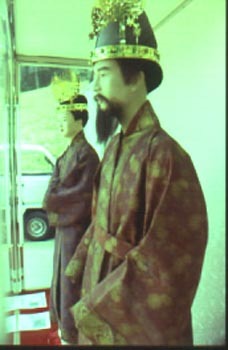 Note the gold crown (actually found in Muryong's tomb) and the style of dress that looks almost like a modern Japanese kimono. This is the Unjin Miruk Buddha (Buddha of the Future) of Kwanchoksa in South Chungchong Province. 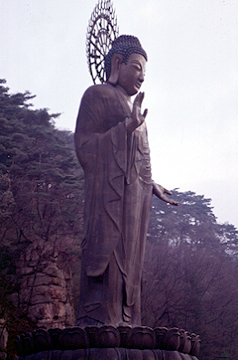 It's the largest free-standing Buddha figure in Korea. This is the Taejosan bronze Buddha of Kakwonsa temple near Chonan. It is one of the largest seated Buddhas in Asia, and weighs 60 tons. It is similar in appearance to statues in Japan (the Daibatsu of Kamakura, and the Daibatsu of Todaiiji in Nara). 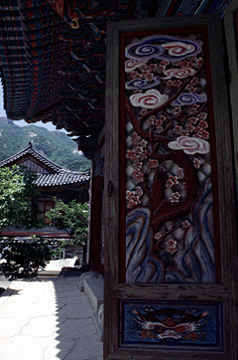 The ornate carved doors of Tonhaksa temple in Kyeryongsan National Park in South Chungchong. The doors are brightly painted with crane, cherry blossom, and bamboo designs. Tonghaksa temple is one of the very few places in Korea for the training of Buddhist nuns. 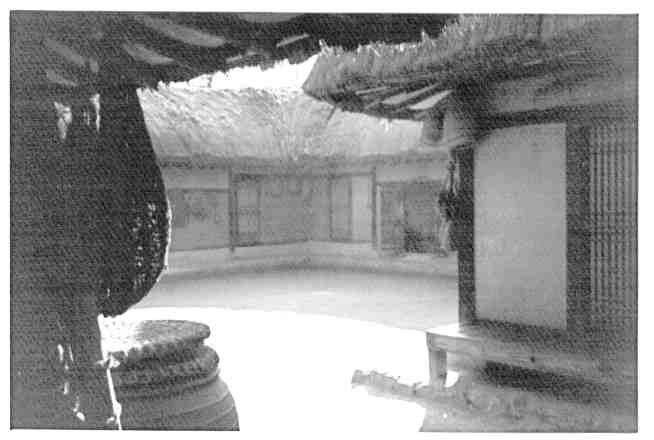 The courtyard of a traditional Korean House. 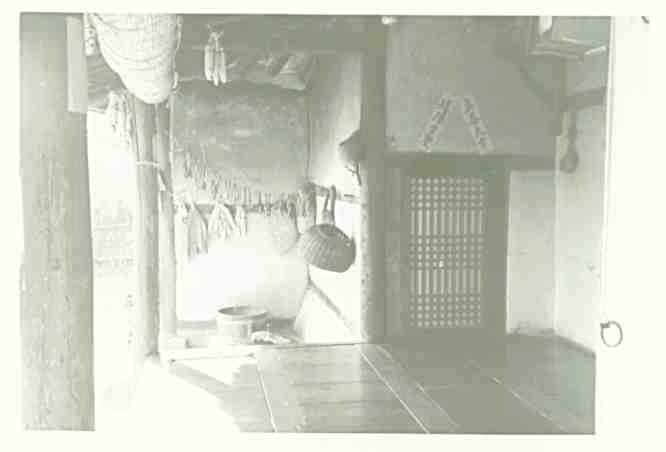 Such houses don't really exist in Korea any more. This one is in the 'Folk Village', an uninhabited tourist facility in Kyonggi Province. 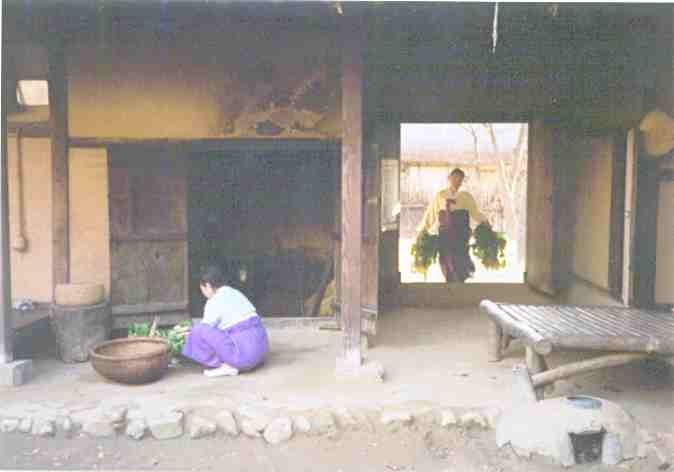 Many such traditional homes in South Korea were knocked down to be replaced by more modern housing, especially during the '60's, when the Park Chung Hee regime started the 'Saemaul-Undong' movement (New Village Movement). ..the wooden deck of a Korean farm house..